TheRustedChain - The Blog: Sharp Shoes. Did you happen to notice these shoes the other day on the New Shoes post? The Boy was hoping you would. He is crazy proud of them. I was jealous of inspired by Laura's daughter's new shoes. So I decided we could make our own. Every year WalMart has these canvas sneakers for $6 each. We've bought them for 4 or 5 years in a row. And wouldn't you know that this year they are nowhere to be found. I looked at every WalMart and Target in a 40 mile radius and they can't be bought. I could buy more expensive ones for $14 or so, but I knew we were going to be coloring on them with Sharpies and I didn't trust my art skills that much. But funny enough, I had an extra pair sitting here at the house, brand new. Last year I'd accidentally bought 2 pairs for The Girl. She only wore one. And they were the right size for The Boy for this school year. So he's the only one who ended up with Sharp Shoes. I just went at them with a Sharpie marker and then let The Boy color them in. When they were done, we did spray them with a coat of clear sealant, to help the color hold better. He could not wait to wear them to school. And I think he even slept in them last night. what a fun idea! they turned out great! What a great idea! My MIL just gave me a plain pair of Keds...I may be breaking out my Sharpies later today. Thanks for sharing! They are so cool! Great job! Super Awesome job Beki! I totally thought you bought them!! Okay, I really want to color some shoes now! I, uh, I mean my daughter NEEDS them! making your own shoes!! how fun!!! Ok, that is just amazing. I was actually wondering where you managed to buy such coolness. 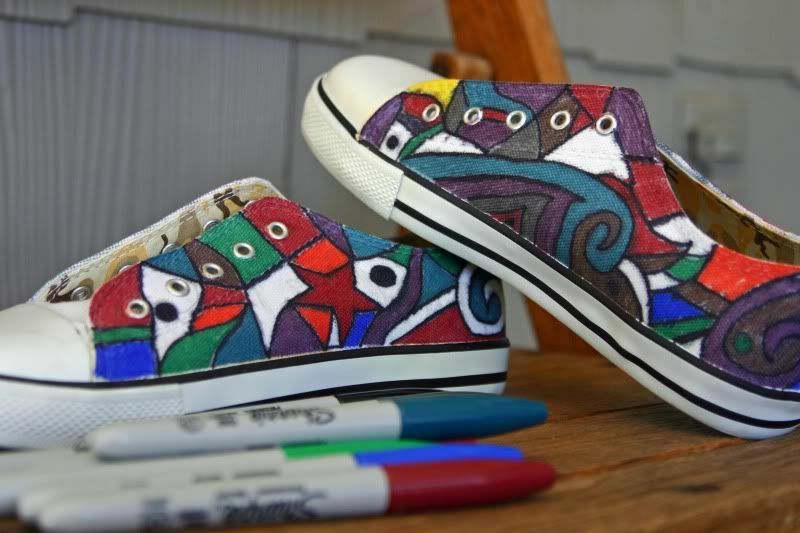 I'm very impressed, and now I think I might have to find my own pair of canvas sneaks. Those are some pretty cool shoes! Thanks so much for your sweet comment...I so appreciate it. This is awesome! He is great at coloring. :) Cant wait ti show these to my daughter. This is very cool! Sign me up for a bling pair!! Too cool! All the more special that you guys made them. What a great idea!! He did a great job!! My son has some graffiti ones we bought at the converse outlet (on clearance) and he LOVED them. He would love to be able to create his own. Those shoes are awesome Beki!!! My daughter will flip when I show her your post. She wanted some super cool Chuck Taylors for school, but they were out of our budget...but we can so do this! Thanks for sharing your awesome idea! Everytime I hear someone say "step 1" I think of that SNL and about pee my pants! It's one of my all-time faves! And my 9yo folds all her clothes and my 5yo folds most of his. I do help him w/his "church" shirts, but his play clothes I let him take care of. I used to get all worked up about them doing their chores exactly the way I would do them, but I've pretty much given that up. I figure they're fully capable and will only get better w/time. Their clothes are clean and put away and that's my main goal. You'll have to let me know how your kids do. those are awesome. i did notice them, but i never would have guessed that you made them yourselves. very creative!! What a fun memory for The Boy! WOW! Those are the coolest! I want a pair!! You are so stinkin' creative and I love it! I love those shoes and that would be so much fun! What a great idea! He will be the popular one this school year for sure! 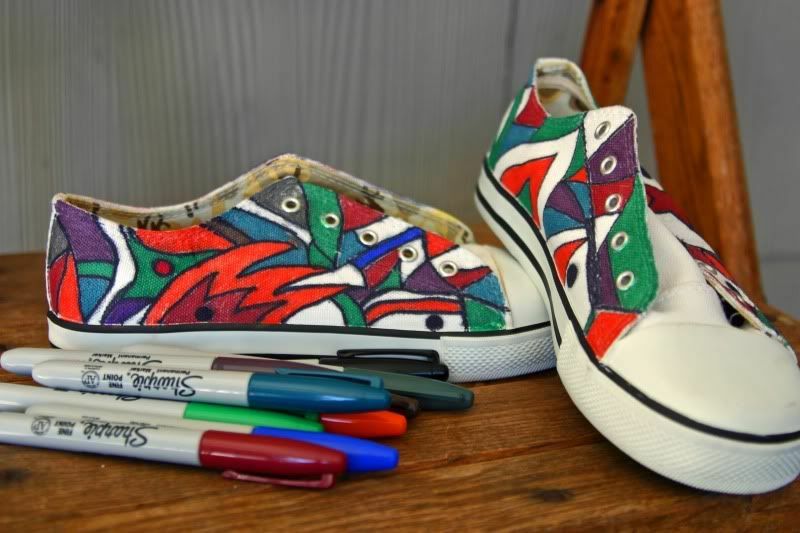 So you better stock up on those sharpies as you may have a line of kids wanting a cool design on their shoes! Brookie makes t-shirts, tank tops, onesies with Sharpies, but we've never thought of using shoes. We are HUGE Sharpie fans! Those shoes are SO COOL. Gotta try that. I love those shoes! And your whole blog, it is so sweet. nice blog.. liked it very much....can someone give me some other related blog address..?? ?ne ways appreciated..!! !